The "Traditional" double-gliding utility window was developed for installation into garages, sheds, pole buildings, etc. where a low cost alternative to high maintenance aluminum and wood windows is desirable. The "Traditional" gliding utility window is constructed of polyvinyl chloride (PVC) which will not warp, peel or corrode and will provide years of trouble free performance. The "Traditional" gliding window is available in standard sizes for many popular rough opening sizes. 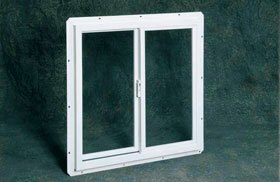 Windows include an integral J-Channel and nailing flange for ease of installation. Available in custom sizes for remodeling projects. NVU2424WD 24" x 24" 23-1/2" x 23-1/2"
NVU3624WD 36" x 24" 35-1/2" x 23-1/2"
NVU3636WD 36" x 36" 35-1/2" x 35-1/2"
NVU4824WD 48" x 24" 47-1/2" x 23-1/2"
NVU4836WD 48" x 36" 47-1/2" x 35-1/2"